Los Angeles Times recently ran a story about the new and improved LAPD. But what attracted the Korean's eyes was this photo accompanying the article. 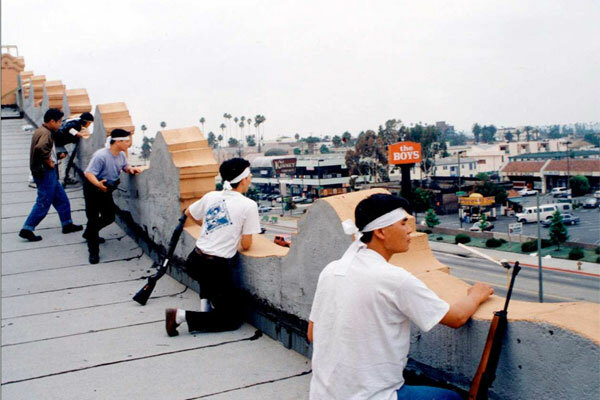 Among the most durable and dispiriting images of that era, however, were those of Korean merchants taking to their rooftops in the opening hours of the riots, arming themselves because they were convinced that they were alone, that the LAPD would not be there for them. They were right. After an evening at the station, I turned to head out. As I left, the desk officer was patiently counseling three Korean men. Dressed in suits, one of them with a notepad, they had come in with a concern. The officer spoke with them, resolved their question and shook hands all around before they turned to leave. The entire exchange was conducted in Korean. The LA riots predated the Korean, so he really does not know too much about it outside of a couple of documentaries and some news articles. Personal accounts and recommendations for books, etc. are welcome. -EDIT 8/10/2011- The Korean noticed that this post gets linked out on various message boards every time there is a riot somewhere -- at this time, with respect to the London riot. The link is usually accompanies a statement like how Korean Americans were able to protect themselves with guns during the 1992 LA riot. The Korean will remind you that having guns did not prevent Korean Americans from suffering the heaviest damage as a group in the course of the riot. The Korean's own view of proper gun control is here. The Korean's more detailed view on guns and riot is here. That's nothing. I remember seeing a video taken from a news copter of a Korean market. Think it's Hannam Chain Stores on Olympic. The workers had brought out bags of rice and stacked them up and formed a wall in front of their store front in L shape, like a firebase in Vietnam. Someone paid attention in their south korean army boot camp. My wife, who is Korean, arrived in LA as an immigrant during the riots. She still remembers her dad putting suitcases and boxes in front of the window to guard against stray bullets. Despite this being probably the worst welcome your new homeland could give you, the entire family all thrived in a matter of years. I was in Korea during the riot. You could cut the tension with a butter knife! Nothing happened but it wouldn't have taken much to put everyone over the edge, I talked privately to some of my Black Soldiers. Lots of them saw what happened to the Koreans as being payback for being a bunch of cruel and racist upstart immigrants. Our KATUSAs were all enraged because the TV and print media reported around 2,000 Koreans were killed in LA. Neither group of Soldiers could be convinced otherwise. Fortunately everyone calmed down and we all got back to normal. Lots of them saw what happened to the Koreans as being payback for being a bunch of cruel and racist upstart immigrants. Even if that were the case, which I HIGHLY doubt, considering that those Korean merchants were in black neighborhoods looking to make money, that still does not excuse the violence. The violence was just an excuse for many to loot from the stores in those areas. Exactly how were those merchants cruel and racist? olsenh24, that's right. I was mostly just noting the views I saw. I was in high school in the San Fernando Valley (not far from the city where it happened). It was pretty surreal. The whole city was under a strict curfew! The pictures of Korean store owners guarding their stores were mostly from looters and gang members who were shooting at them. Most store owners just let the looters take everything from their stores. I remember news reporters trying to interview the looters? The LAPD were overwhelmed. It wasn't until the National Guard came and enforced MARSHAL LAW that this all died down. This whole incident degenerated into a free for all for poor people to steal and cause violence IMHO! After this incident, many Koreans just moved out of those neighborhoods! The blacks in these neighborhoods always complained that these Korean owners looked down at them and not be friendly like not looking them in the eyes when talking? They also complain that many of these Korean store owners were indifferent to the problems in their neighborhoods like alcoholism and crime. Which is true because they would never actually live in these neighborhoods. About 50 people died in and around the city and mostly non Koreans. Exactly how were those merchants cruel and racist? Shooting and killing a 15-year-old black girl who was shoplifting. That is pretty cruel and racist. While the riot predated the Korean, he did hear a lot of stories about it when he came to America five years later. The Korean understands why Korean Americans of that era were like that, but there is no getting away from the fact that they were pretty damn racist. The riot was everyone's fault. My uncle lived in LA when this happened (he even claims he had his picture/footage taken on several occasion, but he could never find one :D). Whenever he talks about it, he doesn't get mad at the looters or even the gangsters - he gets pissed at the LAPD for fleeing the city and leaving the civilians behind. "The blacks in these neighborhoods always complained that these Korean owners looked down at them and not be friendly like not looking them in the eyes when talking?" One of the interesting (and somewhat valid) complaint I've heard which drives some of the animosity comes from Korean store owners employing other Koreans rather than local Black citizens. Yeah, I know this is more a function of owners employing family, but it you aren't aware of this it can be taken the wrong way. Another thing is how stores in the bad neighborhoods consistently charged higher price. There was a great study (can't locate right now) about how stores in bad neighborhoods charged anywhere between 10 to 100 percent more on the same products. This was because there are so many overhead expenses in a bad neighborhood, including extra security, persistent shoplifting, inability to make continued payment (for more expensive items like television that goes out in a financing plan), etc. Of course, from the African American consumers' perspective, it must have looked like uppity Koreans barged into their neighborhood, gouged them and gave nothing back to the community. Yes, I was aware that it was not Chris espousing his own views. I was just angry at those views. They also complain that many of these Korean store owners were indifferent to the problems in their neighborhoods like alcoholism and crime. Which is true because they would never actually live in these neighborhoods. Well, I think it's a double standard when they do not judge black storeowners the same way. And why should business owners care about those things as long as they are not contributing to those problems? At some point, people need to take personal responsibility. What the news did not report in the Latasha Harlins case is that before the Korean owner shot her, Harlins had hit her. There was a non-violent intervention from the Korean owner to get the stolen item back, but Harlins was the first to get violent. The judge in this case was not racist as claimed by some in the black community. It was not simply the case that the owner decided to shoot a shoplifter. There was a violent incident INSTIGATED by Harlins that led to the shooting. But the media only shows the latter part of the video. Most Korean storeowners do not shoot shoplifters or others that come into their store, so that is a pretty weak argument for the racism of Korean storeowners. Yes, I am aware that many storeowners are racist internally, but they also have common sense and know their customer base, so will act civil at least. The riot was everyone's fault. The riot was the fault of the looters and those who were violent. I'm sure many of us have experienced negativity in some form that did not cause us to riot. Well, what about being understanding and trying to figure things out instead of making false assumptions about others? I know that there were false stories in the black community about how Koreans got special government loans to start their businesses, etc. I really feel that it is unfair to blame Korean storeowners for false generalizations made by some ignorants. People need to take responsibility for their own thinking. One cannot demand understanding when they are not willing to give it themselves. Are you aware that news reports have stated that surveillance video showed Latasha Harlins approaching the counter with cash in her hand, implying that she did not intend to steal the orange juice? Do you realize basing your arguments on the assumption that Harlins was a "shoplifter" is incompatible with your final clauses and skews the entire discussion? Do you see the irony and hypocrisy of it? "Well, what about being understanding and trying to figure things out instead of making false assumptions about others?" Isn't the real issue here that this violent altercation over a bottle of juice might've been sparked by Soon Ja Du making a false assumption about a customer, an assumption based on an engrained racial stereotype, and acting on it? "Well, what about being understanding and trying to figure things out instead of making false assumptions about others?...One cannot demand understanding when they are not willing to give it themselves." Hence the reason why we could all stand to *learn* from the events of the LA Riots. Rather than getting into a match of "the blacks were more wrong" and "noooo! It was the Koreans!" Both sides were doing a lot of misunderstanding and being misunderstood. Think about it. When it comes to the riots, you can come up with an objective view of what happened. What you cannot do is go back and reshape the perception each person has. It doesn't matter if that perception is seems right or logical, it is what it is. Most Korean storeowners do not shoot shoplifters or others that come into their store, so that is a pretty weak argument for the racism of Korean storeowners. Don't play dumb -- that's beneath you. The point was obviously not that a single shooting proves Korean store owners were racist. The point was that the shooting represents a culmination of a long-simmering tension, fueled by Korean store owners' racism in no small part. Yes, I am aware that many storeowners are racist internally, but they also have common sense and know their customer base, so will act civil at least. "Civil" is not the word that the Korean would use to describe the actions. Many, if not most, Korean store owners in the black neighborhoods were suspicious of their customers. Presumption of being shoplifters or worse, robbers -- you think black people wouldn't notice that kind of thinly veiled contempt from Korean shopkeepers? Did the shopkeepers have their reason to be suspicious? Absolutely. But was that reason free from racism? Absolutely not -- it was deeply infected with racism. We have to own up what we have to own up. Otherwise, your call for being responsible for own thoughts rings pretty damn hollow. You did not make this clear in your argument, so no, it was NOT OBVIOUS. I stand by what I said. The media kept replaying the part where Ms. Du shot the girl, but never showed the part before that. It was only Korean and Korean American outlets that really showed that portion of the video. I really cannot see how shooting in response to a violent altercation signifies racism. "Civil" is not the word that the Korean would use to describe the actions. Many, if not most, Korean store owners in the black neighborhoods were suspicious of their customers. Well, I don't presume to know how most storeowners think and nor should you unless you spoke to MOST of them. I do know quite a few that were normal or nice to their customers, so I really doubt that "MOST" were uncivil. The second ajusshi from the left is my friend's father. Even before the riots he was a big-game hunter who always had bear, deer and buffalo in his freezers. I'm almost positive that he supplied the majority of the weapons for these people in the picture. I think this is off of the roof of a Swap meet on Olympic, a couple of blocks west of Alvarado. Takes me back. My uncle's grocery store was burned down during the riots. There are pictures and video of the aftermath showing many of his longtime African-American customers weeping with and consoling him. For most of his customers, he provided the only inexpensive, convenient groceries within easy distance. In fact, there was a totally gross Ralph's down that block that people would pass by on the way to his store. On top of that, he provided no-cost check-cashing and credit to regulars, simply as a community service. You make some ignorant statements. "While the riot predated the Korean, he did hear a lot of stories about it when he came to America five years later". Heresay. "The Korean understands why Korean Americans of that era were like that, but there is no getting away from the fact that they were pretty damn racist" Blanket generalization. There are bad apples in every barrel. "Shooting and killing a 15-year-old black girl who was shoplifting. That is pretty cruel and racist" Half cocked assumption. "Another thing is how stores in the bad neighborhoods consistently charged higher price" Free market economics. No one else provided this service, especially corporations. Racism ran both ways. Mostly due to cultural misunderstandings & a language barrier. I knew many business people who had outstanding relations with the community. The little knowledge some/most Koreans & blacks had of each other is what the media portrays and they acted accordingly. Is that ignorant? Yes. But, again, they had a lack of communication with each other. You have the benefit of 20 years of hindsight and yet you are just as ignorant as they were if not more. If you recognize that there was racism going from Korean Americans to African Americans, then we have no disagreement. The Korean's point is that we have to own up what we have to own up. Dang, I'm old enough to have experienced it first hand... Few comments about the 15 year old girl who was shoplifting and than shot and killed by the Korean shop keeper. Yes taking a life is not forgivable. BUT none of you seem to know the story that was conveniently left out by the main stream media. In the local news, the moment of shooting was played over and over, which IMO seriously inflamed hatred against Korean shopkeepers. What they didn't show was that the 15-year old girl hit the small shopkeeper when caught shoplifting. Hard enough that the shop keeper was knocked off her feet. And the 15-year old wasn't a 15-year old in physical size. She was pretty heavy and imo bigger/heavier than the small female korean shop keeper. Don't be fooled by the age of the girl. I can understand why the shopkeeper thought her life was in danger. And on top of that the gun used in the shooting had illegally modified trigger so that slightest touch would cause it to fire. And of course don't forget she probably never attended any sort of training in shooting. As for the Korean shop keepers charging higher price, let's not forget why they were there. Major US corporations (grocery, banks, etc etc) simply pulled out of the area because it wasn't profitable (or so they thought). All Koreans in the era knew owning/running stores in the area was dangerous. Almost every week Korean newspaper carried stories of some shopkeeper getting shot or robbed. In a market economy, you can and should charge higher price if you are taking greater risk (financial and otherwise) for doing business. Yes, many were pissed off at LAPD. The fact Gates was the chief didn't help either. The leadership of LAPD fumbled badly. When the verdict against cops who beat Rodney came out, the top leaders (Gates AND deputy commanders) of LAPD were AWAY on a seminar, somewhere in southern Cal. They should've been IN THE HQ but didn't. Thus the riot couldn't be stopped before it got out of control. I've read an article where hundreds of LAPD cops were gathered in a parking lot, ready to go, but didn't because they didn't get the order. Lastly, the National Guard at least took a day, maybe even 2 before they actually showed up after being mobilized. I still remember people asking 'where is the national guard?' 'When are they coming?' I heard later that they had trouble findding ammo for the soldiers. That was fine but what really got me was a letter by a general of the National Guard sent to a local korean newspaper. The letter basically said the national guards members all had regular jobs and such that caused delay. The tone of the letter was basically it's not our fault and that you are not american enough for warranting faster response. I don't know maybe I was feeling already victimized and maybe something was lost in the translation but I didn't feel good after reading the letter from the general of the National Guard. Uh, no. In fact no such thing. Of course any gun owner can tell you that. I actually came here to find out what happened to the Korean shoe store owner who engaged in a shoot out with rioting thugs and looters? Self defense being so close to a crime in California and offensive shooting in defense of property being definitly illegal here, I wonder if they heard back from any kind of authority, you know when they came back from where ever they ran off to? A detective testifying in the trial said the revolver used in the shooting had a "Illegally modified trigger". Meaning only a slight pressure was needed to shoot, instead of the normal pressure required. But i see your point you being a gun owner. The Korean shoe store owner you remember is probably NOT a shoe store owner but a gun shop owner in Korean Town of LA, CA. Think it's called Western Gun Shop or something. The dude with glasses is the gun shop owner I believe. However when you check out the address in Google Maps now that gun store is gone. He probably retired. It's been what 20 years? Last I heard he was interviewed but never charged or faced any other trouble with police. I actually participated in the march (mostly Koreans) through the Korea Town right after the riot (there were thousands of marchers) and remember seeing him standing in front of his gun store (shoulder holster) and fellow marchers recognized him and clapped. how killing a thief is cruel or racist? are you insane guys? how killing a thief is cruel or racist? It is cruel because the response is wildly disproportionate to the crime. And it is racist because the disproportionate response is at least partially predicated upon the criminal's race. Punishment should be disproportionate to the crime. Otherwise its trade. Tell that to David Koresh and the Branch Dividians. Oh no you didn't! But seriously you have no idea what it is like to be black, you have never lived the black life. It isn't easy. Look at the media they show places like Harlem and (bad parts of) Detroit, people believe that majority of us live like that we're poor, (Native Americans are more poor FYI and Most Asians do well in California but elsewhere majority aren't especially in New York) Over a half of black Americans are middle class (like me and my parents). The reason why Detroit and Harlem aren't up to par is because the police and the city doesn't care about us, period. The police care more about protecting whites than black people. Look in the news what race is getting the most attacked in politicians? Also the media loves to portray is in a negative lights there are tons of things that we do positive more than negative. Oh here's another one, the media doesn't care about black kidnapping victims. Black people get kidnapped every day more than white people but you wouldn't know that because we never get media attention like white kidnapped victims, is all that I mentioned not racism? Also all Black films are never successful unless we're gangsters. With Asians it's even worse not only do they get replaced by whites (cough Avatar and cough Akira) BUT people don't want to see their films either if it's not them doing martial arts. Whites are the privileged, remember that, so in a way, I expect you to say to stop whining. Whites do not deal with racism as much as black people or other minorities, so what would you know about racism and people that encounter it almost daily? I suggest you (if you do read this) to read those links below maybe your eyes will open.